Create Beautiful Woocommerce Stores and Automate with Infusionsoft. Lots of Businesses are now using InfusedWoo! If you are using woocommerce this is a must have plugin. Easy installation and seamless integration. One of the best user guides I have ever seen for any wordpress plugin. 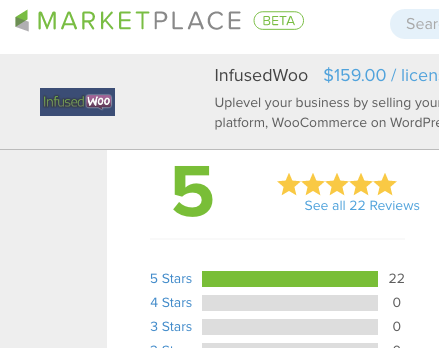 InfusedWoo has been consistently rated 5-star in the Infusionsoft Marketplace. InfusedWoo is easy to setup. Just install the wordpress plugin and configure few settings and it's ready! InfusedWoo comes with an easy-to-follow guide so that you can set it up based on your business needs. InfusedWoo has a built-in Infusionsoft payment gateway that allows you to charge customer using the merchant account you set in infusionsoft. Not only that, the payment gateway can remember your customers credit cards so that the next time they purchase, they won't need to re-enter their credit card details. Works with any Payment Gateways. Aside from its built-in Infusionsoft payment gateway, InfusedWoo seamlessly integrates Infusionsoft with other payment gateways as well. Allow your customer to pay via cheque, bank deposit, or paypal and still integrate with Infusionsoft!